The National Women’s Business Council (NWBC) today announces the appointment of Nina Roque as Executive Director. Nina recently served as Special Assistant to the Secretary of Labor, R. Alexander Acosta, where her portfolio included apprenticeships and women in the workforce, among other policy initiatives. 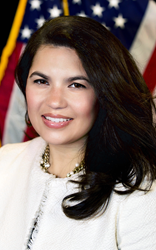 Prior to joining the Administration, she was the Director of Programs and External Affairs for the Congressional Hispanic Leadership Institute (CHLI), a non-profit, non-partisan organization that focuses on youth development and leadership, public service and corporate responsibility. Previously, Nina was an Associate Attorney at a law firm in Raleigh, North Carolina, where she represented employers. Nina also served as a Law Clerk at the North Carolina Industrial Commission, a quasi-judicial agency in the State of North Carolina. Nina holds a Bachelor of Arts degree in Political Science and Criminology from Florida State University (FSU), and a Juris Doctorate from Hofstra University School of Law.